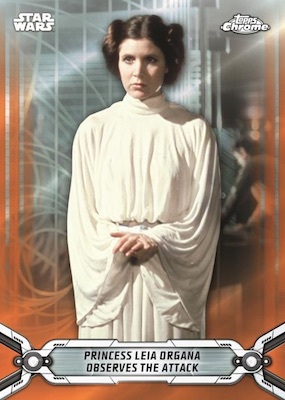 2019 Topps Star Wars Chrome Legacy offers a new trading card brand for the famed Star Wars cinematic saga that only comes in a Hobby format. However, like the Finest and Chrome releases before it, Chrome Legacy utilizes Topps' chromium technology and a Refractor rainbow. Collectors are also likely familiar with the two-hit master Hobby boxes that contain at least one autograph or sketch card. 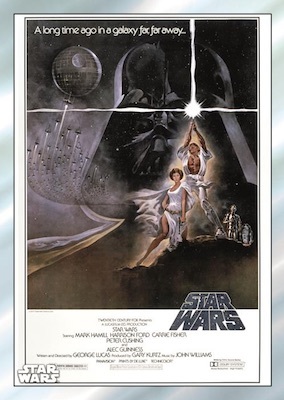 Covering Star Wars: Episode I to Episode VIII (a.k.a. The Last Jedi), the eight-film lineup is summarized through various notable events across the 200-card base set. The 2019 Topps Star Wars Chrome Legacy checklist also features a solid number of Refractor parallels. While the base cards feature on-screen movie moments, the inserts look to other sources for inspiration. 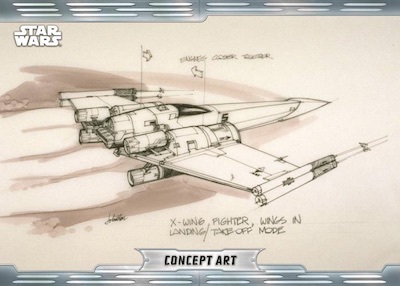 That includes Concept Art cards for ships and Poster cards from the various theatrical releases. 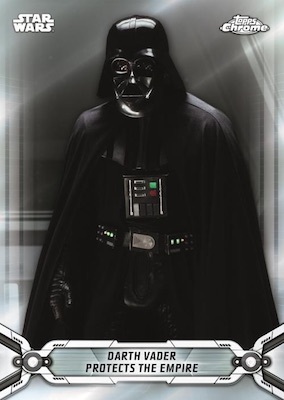 Debuting for the first time in any Topps Star Wars trading card product are the Marvel Comic Book Covers cards. All three inserts work in Green Refractor (#/50), Orange Refractor (#/25), Black Refractor (#/10), Red Refractor (#/5), SuperFractor (1/1) parallels. 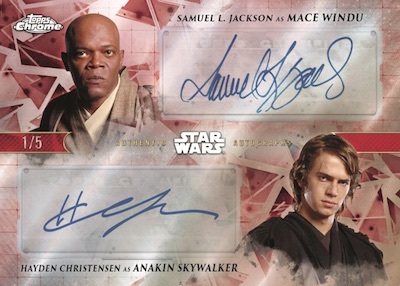 Broken down into the three trilogies, the main autograph choices in 2019 Topps Star Wars Chrome Legacy consist of Classic Trilogy Autographs, Prequel Autographs and New Trilogy Autographs. These add Blue Refractor (#/99), Green Refractor (#/50), Orange Refractor (#/25), Black Refractor (#/10), Red Refractor (#/5), SuperFractor (1/1) versions, as well. The more limited Dual Autograph line only has Black Refractor (#/10), Red Refractor (#/5), SuperFractor (1/1) parallels. Another hit option is a manufactured relic set. The Droid Commemorative Medallion cards have the same Refractor parallels as the autographed cards noted above. Sketch cards also stick to the eight films. Collectors can find standard cards and Shaped Sketch cards that are cut like a Porg. Looks like another average product from Topps. 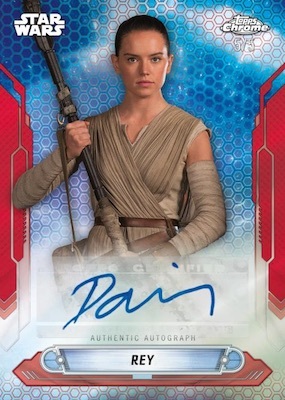 Based on seeing the Harrision Ford as a 1/1, I am sure this product will be like so many others where the autographs you would actually want will be so short printed you will never have any hope of pulling one. Guess we can wait and see but more of the same in my opinion. 2018 TOPPS FINEST STAR WARS HOBBY SEALED BOX - IN STOCK!